You are here: Home / Blog / Kitchen details! I was asked by one of my favorites to show my kitchen! Here it is! I selected each of those things in a different color! The dog bowls…..even they have a story! I hope Bunny Williams…..(who is married to John Rosselli); I hope will hear about this ! the bottom bowl I purchased from Bunny and John’s delightful store; “Treillage” A few years ago! They brought back from Provence a few years ago! I believe in surrounding oneself with things of beauty! Most people might say…….”a Provencal bowl” to hold the dog food? Well; twice a day, I have the fun experience of feeding our two Corgi rescues! they perform like Circus dogs! They dance and leap!Like “Circus dogs”!! a special bowl with a big lump in the middle. He “speed eats” ( My grandson “clocked him once a few years ago on my iPhone! Each day, many times a day, I see this exquisite bowl (the bottom one); and remember Treillage, Bunny, Provence, and being in New York and finding it! A Swedish “traditional motif” St . George slaying the dragon is on it! One of my very favorite fabrics! Since I was first published in 2001; each phone call I have received has asked me the name of that fabric! (really the only feedback from being featured in a magazine)! I am delighted and grateful; a dream come true!Blogging is just way different!I learned what it is called from a viewer of my blog! This is straight ahead……(see the red cabinets on the left)! These are the doors that lead to the side garden. This was my mother’s “teacart”! It was formerly outside…..it holds my silverware and some of my plates! Kitty scratching thing to the left…..covered with “organic catnip” so they lay off the upholstery! (not beautiful; but benign)! this shows the open cupboards above the sink to the right of the aged copper sink! Some of my “Happy Bird” pottery is here……and things collected from my life! The hen soup tureen with the babies coming out from under her wings and everywhere! The tile with my grandaughters footprints when she was born……that says “Poppy loves you”! Yikes! We see it every single morning when “HE” makes coffee! (she is 13 and my height) now! Now you see the island, the trays for breakfast and lunch on the “loggia” And an antique pig on top of the pot rack! This is what my darling assistant wanted to make sure to share !! This is my refrigerator! My wonderful upholsterer made me these fabric boards to be “velcroed” on to my fridge and freezer……. so I can put pictures, invitations, and inspirational quotes on there! I see those many times a day! No Stainless steel to show fingerprints……and a constantly changing array of family photos and wonderful memories!! Finally! The Welsh Dresser! Which hold my now “famous” (not really) collection of Mrs. Flood’s “Happy Bird” collection of pottery from Italy! The hood of the “range is to the left; and this enormous “Welsh Dresser came (after a 9 month wait) in the same color as the island! (duck egg)! I was so impatient and discouraged, I told Adam (who ordered it…….he does all that important stuff!) “It is OK! and he called the company and said………”You made a mistake!We need this piece in our kitchen to live here! We will use this blue one while you make another one in RED”! 9 months later I received this red one…….He was right. I was so delighted to have it be the color that was in my vision! I love, love , love our kitchen! Here you can see the yellow pot rack (also Chalon) and the yellow cabinets on the third wall…..It is hard to tell but the Viking stove is dark red! The little antique stool above is how our kitty gets to her food!Below; next to the “range” is one of a “pair” of panels…..Mrs Munger loved the other on the wall above the staircase to the “bunk room”! She didn’t need two! The one fit perfectly in her house up here in Montecito; and I found it’s partner, delightful and “fey” and whimsical! Right here next to the “range”! (refrigerator drawers under..great for drinks! )Then they don’t take up all the space in the refrigerator! Rosemary from the garden in the “pig pitcher”! Smells wonderful! Another view of the enormous “Welsh Dresser” with the “Happy bird” collection mixed with Provencal “marbleized” plates and family heirlooms! Wendy the kitty sleeps in the biscuit basket; and has since she arrived 10 years ago! I will have to have flowers in there when I show you again! I do hate to “drop names”; but this is the sweetest story! Ten years ago; a few years after we moved into this house we built; Oprah Winfrey bought the property next door! (can you imagine? No, you cannot! )A lovelier neighbor cannot be found! arrived in the most beautifully wrapped boxes you can imagine!the card said….. Here they are at the top of my Welsh dresser. She is the most wonderful of humans……I, frankly, think she is a “walking angel”(with excellent taste!Don’t they look so wonderful with one of my lanterns like Sister Parishs’????? There is a peek into the powder room! Murals that show all the animals who live here! I hope you enjoyed our kitchen! I have the wonderful photographer Mark Lohman for these great photographs! Oh! Please let me know if this is a “snooze fest”! Yikes! I want to know the truth! I read right to the end and I loved it. I loved too many things to enumerate but particularly your mother’s tea trolley. I’m glad it’s safe indoors now. I am also particularly intrigued by the two very slim cupboards either side of your cooker. Trays? And ??? I think you are a singularly generous blogger – both in terms of what you say to others and also what you show of your own life. To be shown someone’s kitchen so openly, and to not be confined to artfully arranged vignettes is a lovely thing. Thank you! And people might look at you strangely when you call your profession fun and lovely but I have a sneaking suspicion you’d find any profession you were involved in fun and lovely, because that’s what you’d go into it looking for. Correct pimp my bricks! Trays are in those narrow cabinets! I do not know ONE person who could possibly even think of taking a snooze when you are saying anything!! I have had the pleasure of being in this divine kitchen many times and watching you actually prepare lunch for me!! Moments in my life I will never forget. One word I might use would be “magical”. Oh Marietta! You adorable creature! I ADORE you! Blogpost coming soon on Sea Meadow”! I spent 20 years on where you live! What fun!!?!! Marietta; you are invited BACK!!! SOON!!! This is exactly how I want your book ! Can’t wait till it’s done. I look at the pics and see my late mentor Mary Kistner. During WWII she was the 1st woman given the job of store decorating for Rich’s in Atlanta. Of course her home was in magazines. Loved everything about her garden, home, her. She was the closest, in real life, I had ever seen comparing to Parish Hadley work seen in the 80’s. My favorite. Then you include their work in your post. Me too with posting. Stolen into the ether last time I tried on your site. Can’t wait to read this post again when I can peruse slowly instead having to leave for work. Adore, love all you do. After seeing so many white kitchens, or white and black kitchens, or gray kitchens (you get my drift) your kitchen is a feast for the eyes! I cannot remember being so inspired as I am now just taking in all the photos. Love all the color, the pottery (those bird plates! ), fabrics (that skirted sink! ), and oh the color! It is truly an original that looks like it has evolved over time. I have tried to take my kitchen from ordinary to original as well by painting the cabinets green and island black. It’s still a work in progress. Seeing yours makes me happy! Thanks for sharing. are you kidding? I love your blog! What a lovely compliment! I am just in love with this kitchen!! I love that it has color and personality. So happy Delores shared this. I would like to try again. You are fearless! 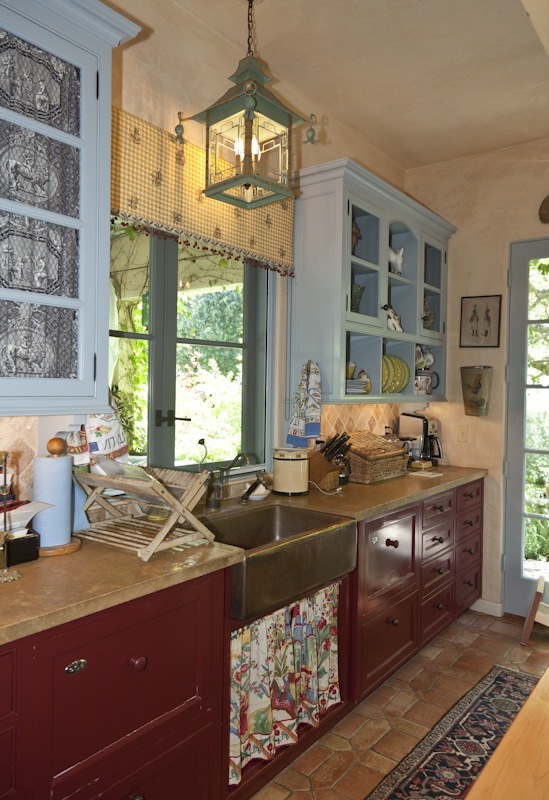 Your beautiful kitchen pops alive with your use of color, texture, and mixture of acquired pieces. It is great to see a kitchen that is “lived in” and “used”; it truely is the heart of the home, and your kitchen reflects that in every square inch of space. No worry, I did not touch the “snooZe button”, I enjoyed every story that went along in making your kitchen wonderful. When lunch time comes around I can visual see you gathering food to place on the green tray and carry it to the loggia. It is very special that you shared so much detail with us in such a fun way. Thanks. I agree with Delores about the overwhelming pale sameness of kitchens these days. Love the love that shines in every corner. Hurrah! A little weary of the chilly elegance of white kitchens, (apologies to all white kitchen owners) I revelled in each of these colour saturated and joyful pics. Thank you for sharing all the anecdotes as well. Your fabric covered frig was a wonderful solution to magnet clutter. May this herald a return to visual warmth and a demonstration of one’s heart in the kitchen. Thank you for showing us your wonderful kitchen. I love unfitted cabinents, so rarely seen are kitchens such as yours. I hope sometime to see your house and past ones in a book! Thank you so much! Our house was in a book! Santa Barbara Living by the brilliant Diane Dorrans Saeks!! She is a wonderful writer; and it is a really lovely book! Our former house in Pasadena (from which we copied much of the floor plan) is also in a book! The Los Angeles House by Tim Street-Porter! A wonderful interior photographer! These “scouting shots” are to be in a new magazine;”French Country” debuting in October! 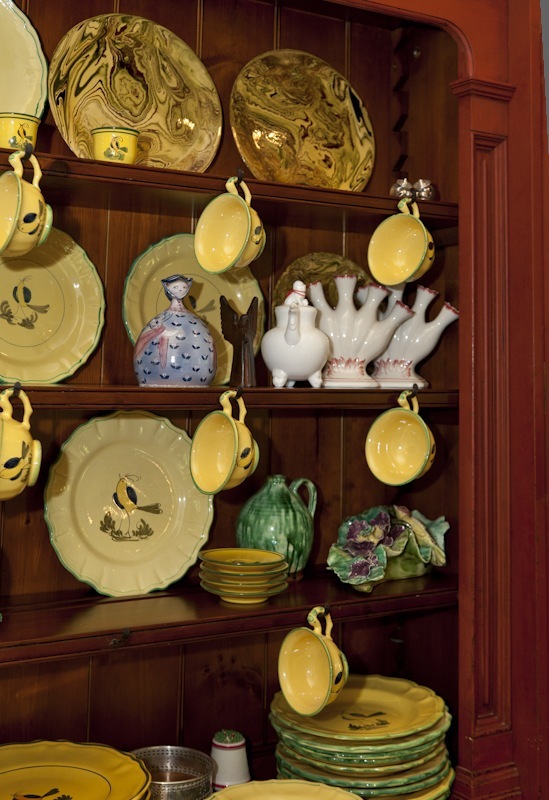 Your kitchen is unique and totally charming…and you were right about the Welsh dresser. Red is the only color it could be. Thanks too for all the stories that go along with your wonderful collections. Adam (my hero) said…..well; not this American! Please look at the “purchase order”! Honestly, I would have given up. Adam just had all the facts; and he provided the “need’ when they provided what we ordered! I felt so loved when he insisted that we get what was in my “vision”! Absolutely inspirational! Love the colours and the fact that everything is useful, a real working kitchen, nothing staged. Your posts are so enthusiastic & joyfujl! No snoozebutton here! Thank you for all that you do, all of your support and just for being amazing. I’m in awe! So much more and better than I ever imagined!!!! Charm, grace, elegance. And so, so very friendly and personable. Only a handful of people can pull a room together like you’ve done here! So many colors, textures, etc. – all with a wonderful story and history. It’s a lesson on how to make your house your home!!! PS: Thanks for the plug, too! Love your kitchen – so fun, interesting and beautiful. Thanks for sharing the stories too. Well, we too call our Corgi CIRCUS DOG!My dogs eat out of urns!!!!!! !LOVE your colors!You are the only other woman I know who adores color!Ditto here!!!!!! !LOVE your kitchen and how everything has a story!I too have a story for just about everything I own!Then on to DDS!Met her last year at FORT MASON ANTIQUE SHOW!!!!!!!!!!!!! !She does write beautifully!BUT I ADORE HOW YOU WRITE!I must go look for your HOME in SANTA BARBARA LIVING!!!!!!!! !What happened to my phone call?Mornings are good too! I tried to subscribe t HB daily email! didn’t work! Thanks for the “heads up”! when can i move in???? your house is so GORGEOUS and i love the kitchen !!! Now that is some compliment! Wow! Thank you, Joni! You know I love Texas! Did you know the “Dallas Women’s Club” hired me to do a “speaking engagement”? I have never had more fun! I thought there would be 30 women “having lunch”! There was an auditorium with 600 people…..not one; but two days! And they paid me handsomely! Texan women are the nicest and friendliest, and warmest women I have met anywhere! Just flinging you a compliment out of the blue! Penelope, I am not sure what happened, but I posted and it just disappeared. Love your kitchen. I was up in your neck of the woods visiting a designer who bought a home up near you. Her name is Carol Glasser. I am going to send her your blog. Thank you so much! I’m not sure what happened; but I found your comment in spam! I set that straight!!! Penelope you home reflects the finds that are so memorable to you. Everything is perfection in the sense that is entirely you and your personality. Isn’t that how we should all live? True to ourselves! Your kitchen is so warm and a true “one-off.” I love its unfitted look. Your Rosselli / Sister Parish pagoda lantern is fabulous—charming Chinoiserie touch. And I love your mother’s Greek key tea cart. It would be divine in my shop!! Thank you for sharing! I have close friends in Washington……..I bet they have already found you! Mimi Dorment? I love your taste and style! And your blog!! via email! This darling girl used to work for me in Pasadena! She is so creative and so talented….. Seriously; Can you even imagine receiving this note? She makes my heart sing! She is the smartest. most creative person……and is the Biggest help with the biggest heart! It Is I who am so lucky to have HER! Just had to publish it! Thank you, you darling creature! What a great, comfy, REAL kitchen! It looks well used and well loved. I also adore the ceramic lambs, bunnies and chicks! very sweet. Your kitchen is amazing! If I were to build my dream kitchen I would copy yours! What a warm, cozy and welcoming space. Not staged – which I hate. Just beautiful! Your kitchen is amazing and adorable! Very nicely conceived by a discerning eye. Interestingly the building that we currently live in, built along Jugendstil has a 5ft high chair rail effect painted in the same ‘red’ tone (with a wood grain effect given by brush strokes). The crown molding is in sage greenish tone with a leaf/scroll pattern in plaster that gives and embossed effect. The combo is white, red and green which lends itself beautifully to the architecture/period of the building. Looking at it in isolation, who could’ve imagine that!